God is Beauty and loves the Beautiful - Prophetic saying. 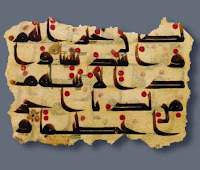 In Islam beauty is seen as a quality of the divine, and is frequently expressed through the use of vibrant colours in illuminated manuscripts often unparalleled by other artistic cultures; superb and intricate designs and most importantly, the use of beautiful and often highly complex calligraphy not only as a tool of decoration but also as an expression of faith. Iranian-born Professor Nasser David Khalili is custodian of the world’s largest private collection of Islamic art. The Arts of Islam, a major exhibition consisting of more than 350 rare and beautiful pieces of Islamic art from the Khalili Collection, is open to the public at the Art Gallery of New South Wales and exhibiting from 22 June till 23 September 2007. 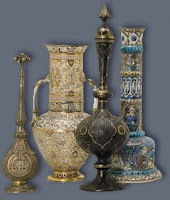 The Nasser D Khalili Collection of Islamic Art features over 20,000 works, many of them masterpieces. Spanning thirteen centuries, the collection is unrivalled. Professor Khalili is an eminent scholar, having completed a PhD in Islamic lacquerware, as well as holding chairs and professorships at various universities. One of his reasons for assembling the Khalili Collection has been to promote a greater understanding between people of different cultures and faiths and to increase awareness of the wide artistic achievements Islamic culture has provided in the realm of world art. A devout Jew himself, his desire to encourage cross-cultural understanding led him to found the Maimonides Foundation, a charitable organisation which aims to encourage peace and understanding between Muslims and Jews and show that there is more that unites the two religions than divides them. He has often been quoted as saying ‘the real weapon of mass destruction is ignorance’. All Khalili’s cultural and educational endeavours, as a patron, writer and lecturer, flow from these convictions. He believes people in the West generally do not know how much they owe to the Muslim cultures. Art, he says, unites humankind.
. read deatils about the exhibition here.
. watch an echanting slideshow of islamic art collection here.